Moroccan energy expert Dr. El Mostafa Jamea questions the benefits of the large-scale project Desertec for the local communities. He emphasizes their concerns and critics as well as possible alternatives in the sector of renewable energies in North Africa. 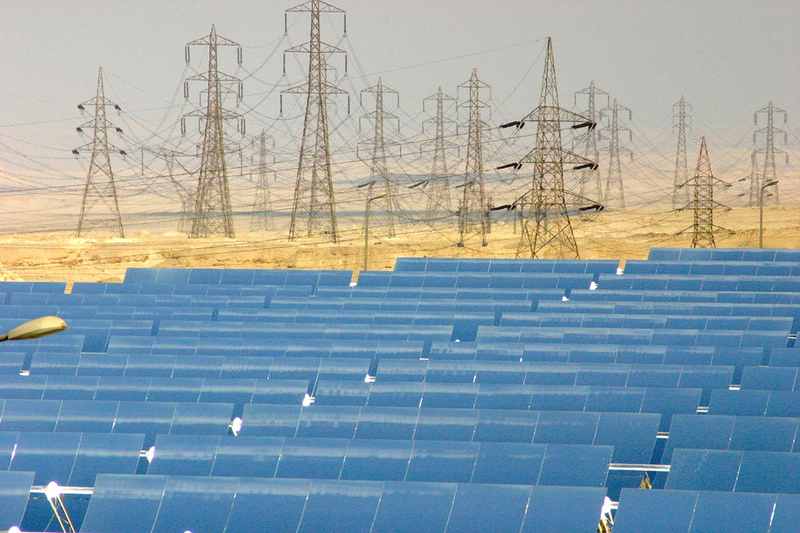 North Africa is endowed with abundant renewable energy resources, which can supply the whole, current and future, electricity demand in the region. These resources can also be exploited in generating clean electricity and exporting it to the European Union (EU). The exploitation of renewable energies resources in North Africa should lead to job creation, income diversification and socio-economic development; it is an opportunity to create hopes and prosperity for the future generations and more stability in the region. The development of renewable energy in EU (mainly in Germany, Denmark and in Spain), has pushed the North African countries to start planning and developing renewable energy projects. Morocco and Egypt took the lead with wind energy projects. At the same time, the technological progress in wind energy and photovoltaic (PV) pushed the entire region to consider more ambitious plans in exploiting renewable energy resources. 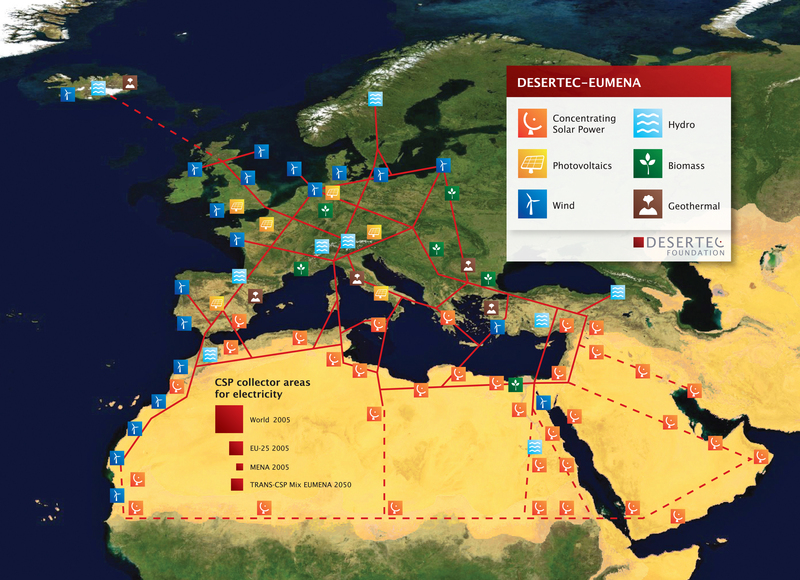 On the northern side of the Mediterranean, Desertec foundation developed the Desertec initiative which is a plan consisting on the exploitation of the abundant renewable energy resources in the desert of the Middle East and North Africa region. The long term objective of the Desertec initiative is to meet the whole electricity demand in the MENA region and to supply 15% of the electricity demand in Europe by 2050. The initiative is considering transporting the generated electricity using high voltage direct current (HVDC) in order to minimize the transmission losses. It is estimated that in order to achieve this ambitious plan, a total investment of more than 400 Billion Euros will be mobilized. The Desertec plan is so huge and will have considerable impacts on the environment and local communities in the region. The Key facts of Desertec initiative are: it is a large industrial project; it requires thousands of hectares; it requires huge amounts of water for its function; it will use thousands of tons of solid materials; it is an intensive capital investment; it is a multilateral partnership; it will produce clean energy; and, it will use HVDC power transmission lines. Another aspect of the Desertec initiative is its focus on concentrating solar power (CSP) technology. This technology is still not competitive in the market compared to other renewable energy technologies such as wind energy and PV, and creates fewer jobs compared to other renewable energy technologies. In such big projects, it is opportune and worth to study the potential environmental and socio-economic impacts on local environment and communities. It is very important to assess objectively, precisely, carefully and concisely these impacts and to reflect on the elegant solutions in order to mitigate the negative ones and to think about maximizing benefits for the local communities. On the other hand, the planning of Desertec initiative involved few development actors from the South of the Mediterranean, most of them representing public institution and central authorities, and practically no representative of the local communities; whereas, local communities, via their representatives and leaders, are essential actors in the successful development and implementation of any project in the region. Dialoguing with local communities demonstrates that these communities are seeing with doubting eyes the project: The project will use land, which they are using; it will use fresh water, which is already not sufficient for their consumption and very scarce in the region; it will impact the surrounding fragile ecosystems, even it is stated that the North Africa desert is considered a true desert where practically the soil is inert. Why only large corporates and finance institutions are being involved in the Desertec Industrial Initiative? Will DESERTEC be again another win-lose partnership? Will local communities get only pollution and waste from this initiative? Who finances what? And who owns what? Will these projects be implemented more for political reasons than for socio-economic and environmental considerations? The first CSP DII in Morocco project was awarded to an international consortium without the involvement of any local company! It is financed by the Moroccan tax payer?! Local communities are asking to be part of the exploitation of the renewable energy; they do not want to supply only work for unqualified jobs! They want as well to have the opportunity to invest in renewable energy to sustain the development of their land and communities! The local communities claim that their resources should be respected! It is not clear how much jobs would be created locally?! Social Acceptance: Local populations often do not accept the big infrastructural project. To which extent local communities and their leaders would be involved in the design of the projects? Will Morocco, Tunisia and Egypt substitute dependency on energy with the dependency on foreign expertise, technology and knowledge? As stated above, renewable energy is an opportunity for North Africa to diversify its economy, create jobs, income and clean energy to be used as motor for other economic activities such as sustainable agriculture, sustainable tourism, low carbon industries and services… etc. It should be a motor to achieve economic shift and development responses with regard to the development claims raised during the Arab Spring. However, large scale CSP projects, as planned in the Desertec initiative will not maximize the socio-economic benefits for the local population. That’s why; it is in the interest of all to adopt alternatives and new approaches to develop renewable energy in North Africa: Alternative projects to Desertec in terms of projects size; Alternatives in terms of project locations; Alternatives in terms of technologies to be used (Desertec initiative and international development agencies should adopt a technology neutrality); Alternatives that will expand and boost the use of the solar energy applications; Alternatives that can be launched through the adoption of adequate legal and administrative frameworks; and the adoption of liberal policies in terms of electricity production and distribution. Adoption of feed in tariffs and Net metering mechanisms for PV will boost the development of this sector and reduce the expensive public subsidies for conventional energy; Local and small investors can create small-scale projects and this will lead to empowerment of local communities and more awareness about environment protection and climate change. Emerging Concentrated Photovoltaic (CPV) technology is very promising and will definitely capitalize, in the near future, on all the advantages of PV, above mentioned, and reduce further the cost of kWh generated. The investment in PV projects will secure energy supply, reduce transmissions losses, reduce the greenhouse gas (GHS) emissions, and improve the technological progress of North Africa. It will also create the conditions for European SMEs to invest and partner with local SMEs in investment on: components manufacturing, project planning, development, implementation, and Maintenance and operations. The Atlantic coast of the North African region has huge wind energy resources. These resources can be exploited using the wind energy technology, which is already cost competitive, mature and very reliable and has low financial and socio-economic risks. The investment in such technology in North Africa will be more opportune in exploiting renewable energy and testing its export from North Africa to Europe. Since this technology will not need huge water quantities required for the daily operations of the CSP plants, and enable the multiple use of land, it will also maximize the benefits of any joint venture investments between European and North African countries. Wind energy provides a low cost energy choice and is a variable power source. It is the less expensive part of the energy mix compared to solar, and storage has not really been an issue so far. On the other hand, across the North African region, considerable wind resources exist and can be exploited in generating clean electricity for local consumption. Egypt, Morocco and Tunisia are the most endowed with abundant wind energy resources. These countries can boost the private investment by creating adequate legal and administrative framework for investment, production and electricity distribution. The most important source of renewable energy worldwide is the energy that we do not consume; we just waste. By saving energy and improving the efficiency of our energy use, we will be able to reduce the GHG emissions, save capital that we can invest in reliable renewable energy technologies. In the Euro-Mediterranean area, the potential in energy efficiency is enormous. There are many plans consisting in improving resources efficiency and energy efficiency across this area. Exchange of expertise and knowledge, as well as Euro-Mediterranean cooperation in this topic, is highly required to generalize benefits. In the meantime, North African countries should adopt strong measures to achieve higher energy efficiency. Approaches that will offer practical solutions to meet the energy needs without sacrificing socio-economic development priorities. Public authorities should as well develop energy efficiency as a mean to create jobs in engineering, consulting and technical firms. When planning and deciding to invest on renewable energy, North African countries, and behind them, the entire international development institutions and agencies should take into consideration the enormous socio-economic challenges, which these countries are facing or will face in the near future. The local populations are starving for more equitable and sustainable development, and for more fair distribution of economic development benefits among regions and society members. Any development of renewable energies and local economies should be accompanied with more transparency, democracy and respect of the basic human rights and freedom in the region. This paper was first published by AfricAvenir as part of a series on renewable energies and their ambivalent impacts. Dr. Mostafa El Jamea graduated in Engineering (2002). He holds PhD in Sustainable Management of Resources from the Polytechnic University of Marche (2009). He is working as Senior Expert – Renewable Energy, Climate Change & Environmental & Social Compliance at German ProfEC GmbH, and acting as its representative for the MENA region. In this position Dr. El Jamea is also a member of the GVEP International.